Get a taste of the action with these photos! 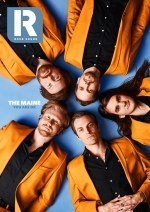 Current Rock Sound cover stars The Maine, presented their biggest UK headliner at Kentish Town Forum over the weekend and also got to have a sneak peak at their feature in the magazine. Mayday Parade and The Wonder Years hit London for a massive co-headline show at Troxy over the weekend, with support from Movements and Pronoun. Jennifer McCord was there to capture all of the action both on and off stage. On Saturday Architects tore up SSE Arena, Wembley and Jennifer McCord was there to capture all the action. Jennifer McCord captured all the on and offstage action from Chase Atlantic's sold out London show. Bring Me The Horizon have just wrapped two nights at London's Alexandra Palace, with support from Fever 333 and Yonaka. Jennifer McCord was there to capture all of the action. All the action from on and off stage when State Champs headlined London's Roundhouse, with support from Seaway and Stand Atlantic. Knuckle Puck headlined London's Electric Ballroom, with support from Tiny Moving Parts and Movements, and Jenny McCord was there to capture all the action. After Palaye Royale's show at Koko had to be moved due to urgent repairs being undertaken on the venue, Palaye still turned up and played a free acoustic show outside on Friday. Jenny McCord was there to capture the intimate affair.